The phrase “the mystery of His Nativity” is taken from the Preface of the Masses immediately before Christmas. This wording struck me for several reasons. One has to do with the notion of “mystery.” We actually know quite a lot about the Nativity of Christ. We know the place and the circumstances. We know the parents. We know the names of the rulers and emperors at the time. Much enterprise over the centuries has gone into denying these facts. Clearly, it is because these facts are true to careful and responsible investigation; as they are, we cannot maintain that here is just another birth of some unimportant Jewish child during the reign of Caesar Augustus. Yet, with all the data, we still sense a “mystery.” Something more is there. The more important part of the “mystery” concerning this birth includes the issues of time, place, and circumstances but goes beyond them. “Mystery” does not mean something wholly unknown. Yet, they happened “in the fullness of time,” as if to say that they involve a plan, an order, and an intervention. That a child with a name was born of Jewish parents from Nazareth is intelligible. But in Bethlehem when Palestine was under Roman rule, “when the whole world was at peace,” is that not provocative? How can God be with us? Why would He want to be? The parents are aware that His origins are more than usual. His disciples come to associate Him with the Word of God. He is “made” flesh. He dwells amongst us. He was from the “beginning,” we are told. In Him all things are “made.” We hear of the Alpha and the Omega, the beginning and the end. In the “Four Quartets,” T. S. Eliot wrote: “In my beginning is my end.” How can this be true of all of us unless it be true that the beginning and the end are ordered to each other? At His birth, Christ’s conception becomes public to shepherds, to the world. We wonder about the difference between a child’s initial conception and his birth nine months later. A British court decided that a child in the womb was not in law a “person.” This arbitrary decision was based on nothing other than the will to allow abortion with legal impunity. Otherwise the whole modern practice of denying the full dignity of a child would be undermined. So the court decided to call what is undoubtedly in the womb before birth simply an “organism.” This wording is a form of nominalism. Basically, it is a lie put into law. This article is from The Reason for the Seasons. But I bring up this recent case for the light that it sheds on the birth of Christ. We know that Herod, when he heard of Christ’s birth, sought to kill Him. If Christ really were a king, He would be a threat to Herod’s throne. Herod missed killing Christ. His parents quickly bore Him off into Egypt. But Herod did manage instead to kill many other born children under two years old in the area. It is impossible on any scientific or commonsense grounds to deny the abiding unity of a conceived human person through gestation, to birth, to infancy, adolescence, maturing, old age, and death. If we insist on pretending a discontinuity between conception and birth, we must make the birth of a child, not his conception and gestation, to be a person’s “beginning.” In modern legal fiction, human birth alone begins personhood. The appearance of any “person” is thus an infinitely more miraculous event than the birth of Christ. In Christian revelation, the natural order of gestation retains its ordinary integrity. Mary carried and bore a Son. In the modern legal view, before birth a woman conceives and bears in her womb an “organism,” but no “person.” The “person” on actual birth is the man from nowhere. If the “organism” is premature, it becomes a “person.” The non-premature “organism” is not a person. The “person” has no real origin. He is a figment of law, not the recognition by the law of a reality that is a human person from his beginning. We do not claim that Christ came from nowhere. He came from the bosom of the Trinity, where He is the Word. In the fullness of time, He is sent into the world, through the consent of a member of our kind, His mother, Mary. He is true God and true man. “The light shines in the darkness and the darkness comprehendeth it not” (John 1:5). The only addendum that needs to be made to these considerations on the Nativity of Christ is that the word “person” itself, a word from Greek drama, came to be the very word used to indicate the uniqueness of Father, Son, and Spirit within the Godhead. Each Person is itself fully God, fully open to the other Persons but not becoming them. When the Word, the Second Person, became man, He taught us that all persons, from their real beginnings in eternity, in their conception and in their nativity, are open, if they would receive it, to the life that the Son offers in a gift to all in His birth. The British and other courts seem shrouded in a darkness that refuses to see the light shining on what is right before them. “No one has ever seen God. It is God, the only Son, ever at the Father’s side, who has revealed Him” (John 1:18). This is the “mystery” that Christ’s Nativity announces. Editor’s note: This article is from a chapter in Fr. 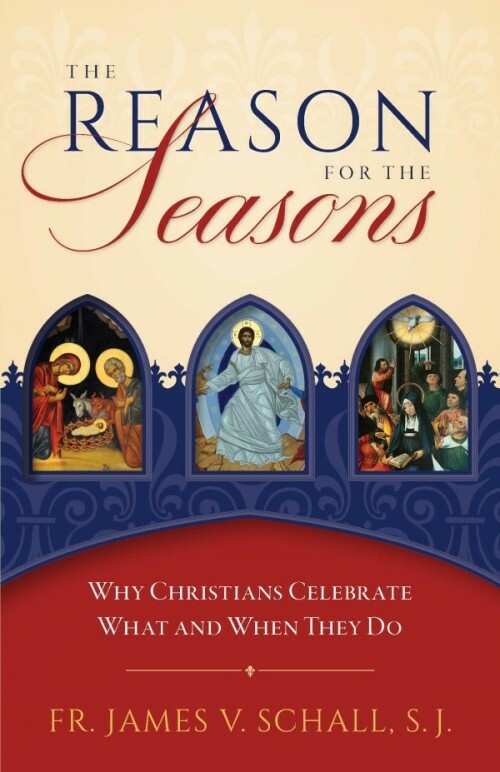 Schall’s The Reason for the Seasons: Why Christians Celebrate What and When They Do, which is available from Sophia Institute Press.